What a shot: Imagine hitting an approach to that bluff. An announcement was made last week that plans are afoot for construction of another dreamy links course on the southern Oregon coastline. Thirty miles south of Bandon Dunes, on the 1,100-acre Knapp Ranch outside the small community of Port Orford, Pacific Gales is at the post-embryonic but pre-construction stage meaning the people behind it are fully committed to its development, but they have yet to receive all the necessary permits and investment to make it a reality. It is potentially very exciting for people who enjoy pure, ground-game golf untainted by bogus intrusions such as waterfalls, cartpaths, and fairways lined by houses. Oregon's state laws concerning development on the coast allow for re-zoning of low-grade farmland for the construction of stand-alone golf courses which means Pacific Gales should, in theory, pass through the courts relatively easily. We spoke with the project manager Troy Russell to find out more. Russell was part of the team that built Bandon Dunes in 1997 when he worked alongside lead shaper Jim Haley whose company, Elk River Property, is the driving force behind Pacific Gales. (We will be interviewing Haley and the course's designer, David Esler, in the coming days). Troy Russell is a big fan of hickory golf. Have you and Jim Haley remained in contact since your days at Bandon Dunes? Yes, Jim and I have been friends since 1997. In the years between Bandon Dunes and Pacific Gales, we probably saw each other three or four times a year. How aware of the site/project were you before being taken on as project manager? I grew up on a dairy farm due east of Bandon. I first visited the Knapp Ranch some time during my teenage years on farm business. So I had been aware of it for a long time. In ’97 at Bandon Dunes, Jim Haley asked me if there was anything like Bandon up or down the Oregon coast. I told him I knew of a place that was very similar about 30 miles south at Knapp Ranch. How is this job different/similar to what it was during your early days at Bandon? It’s very similar, at the front end at least. We’re involved in pre-construction and we’re doing some clearing but we obviously can’t do too much until we have the necessary permits. So at the moment, most of what I’m doing is marketing – getting the word out. The word has actually been out around here for some time, though I’m hearing from journalists and other industry people elsewhere in the country that they had no knowledge of Pacific Gales until last week. The population of Port Orford is just over 1,000, so word gets round a place like this pretty fast. I’ve not done a lot of marketing in the past. It hasn’t been my bailiwick. But it’s not rocket science. And places like Pacific Gales market themselves to a large extent. How do you compare the sites? Which course at the Bandon Dunes resort will Pacific Gales most resemble? There are obviously a lot of similarities. They’re both great coastal sites with a lot of natural sand. But because this is a working cattle ranch, the 330-acres of Knapp Ranch that we will be using for the course are a lot less overgrown. Bandon Dunes was wall-to-wall gorse that took David Kidd and the rest of the crew a long time to clear. The gorse at Pacific Gales is limited to the south and west of the site and isn’t nearly so dense or intrusive. Of all the courses at the Bandon Dunes Resort, I suppose Pacific Gales will be most like Bandon Dunes because they are both set on plateaus above the ocean. And the drop-off at the south end of Bandon Dunes resembles that at the north end of Pacific Gales. But the scenery is actually better here than at Bandon. At Pacific Gales, we have the Cape Blanco Lighthouse to the north, and the Port Orford Heads to the south. And due east is the Coastal Range and the Rogue River Siskiyou National Forest. And the plan for Pacific Gales is somewhat different to Bandon Dunes too. Mike Keiser wanted to build a big resort; Pacific Gales will be a course and a clubhouse - there are no plans for on-site lodging. So Mike and his main advisor Howard McKee had a tough time getting the necessary permits. Thankfully Howard did a brilliant job securing them. These things are never a foregone conclusion, but the process for Pacific Gales should be a little easier. What is your schedule at the moment? Can you do much on-site before the necessary permits are granted? Not too much on-site, but I am doing what I can to drum up local support which means meeting with groups like the Rotary Club. Everyone here is curious now that the cat is out of the bag. Nearly everyone I’ve spoken with so far has been very positive about the project. Even the neutrals who may have been slightly dubious to begin with usually feel differently about it after we have spoken and I’ve told them how little it will affect the local environment, but how positive an impact it will have on the local economy. Once you get the permits, what will the construction schedule be? The best case scenario is that we will be granted the required permits by late March of next year, and we will be able to start work in April. We wouldn’t be able to actually construct the holes then because it is too windy on the coast during the summer, so we would spend that time building retaining basins, an irrigation lake, the pump station, and some utility roads. We will put in the infrastructure before starting work on the course itself at the beginning of fall. We should have the south nine cleared and shaped by the middle of November when we’ll shut down for a couple of months. We’ll get going again in February 2015 and build the north nine. We should be done by the end of June when we’ll leave it to grow in over the summer. If all goes according to plan, the course might be playable, and we might be able to host some preview rounds, in September. Another exciting shot through the dunes. Who will be on the construction team? Besides me, Jeff and Jeremy Knapp will be involved because it’s their ranch. The guys behind the project, Jim Haley and his partner Jay Kenyon, will obviously be here too. But beyond that five, we’re really not sure. We’d probably need a dozen total but, like I say, we haven’t thought about who the others would be, although we’d like to hire local guys. 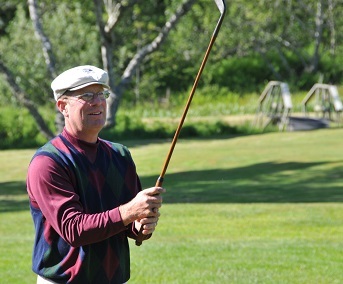 Were you familiar with course designer David Esler before getting involved at Pacific Gales? How impressed with him are you? I wasn’t very familiar with David prior to getting involved here, but I had heard of Black Sheep GC in Illinois which I knew was very highly regarded. I’ve got to know him pretty well over the last couple of years, and can tell you he is a super-nice guy. Like Bill Coore nice, and that is saying a lot. I really enjoy talking with him about the course’s possibilities. We talk about bunker shapes or green depth, things like that. We try not to have any preconceived notions, but the more we talk the more certain specific holes we both know crop up. Do you foresee any difficulties with the terrain and sand? Will maneuverability be a problem? No, I don’t think so. A lot will depend on the weather though. This fall was so perfect we could have got a lot done, but who knows what will happen next fall? We might be beset with terrible conditions we can’t work in, and the schedule will have to be put back. But the site isn’t as raw as Bandon Dunes was. There isn’t as much gorse and not as much sand. And, because it’s a working ranch, some of the service roads are actually already there. So it should be a relatively straightforward build. Have you decided which turf you will use? It will all be links fescues. Pure fescue. Will you stay on as superintendent when the course is open for play, like you did at Bandon Dunes? Yes, that’s the plan. And we hope the locals we hire for the construction crew will also stay on in some capacity, probably in maintenance. We were talking with David Kidd in the summer about his new course at Gamble Sands in central Washington. He said that because the site was so good, the owner (Gebbers Family) so easy to work with, and the business plan so straightforward (no housing, just golf), he thought it just about the ideal job for any golf course architect. This project sounds pretty similar. Yes, it’s not often an architect, construction crew, or development team get the opportunity to create something like this. I’m sure David (Esler) will tell you something similar. The site here is absolutely fantastic; it will be wonderful to build as good a golf course as we can without needing to be concerned with housing; and it’s a pleasure to work alongside the Knapp Family. It doesn’t get much better. While we’re here; what’s the story with Old Bandon Links (a short, nine-hole course two miles south of town that first opened in 1926)? My wife and I took on the lease in April 2009. We changed the name from Face Rock to Old Bandon Links and renovated it, trying to produce links-like conditions. We offered hickory rental clubs and gutta-percha balls, and it worked very well for four years. But we have two young daughters, and it was getting in the way of family time. So we gave up the lease which was taken on by a gentleman from Sacramento, named Tom Conway. Tom tragically lost his wife during the summer, so I’m not sure if it’s going to survive much longer.